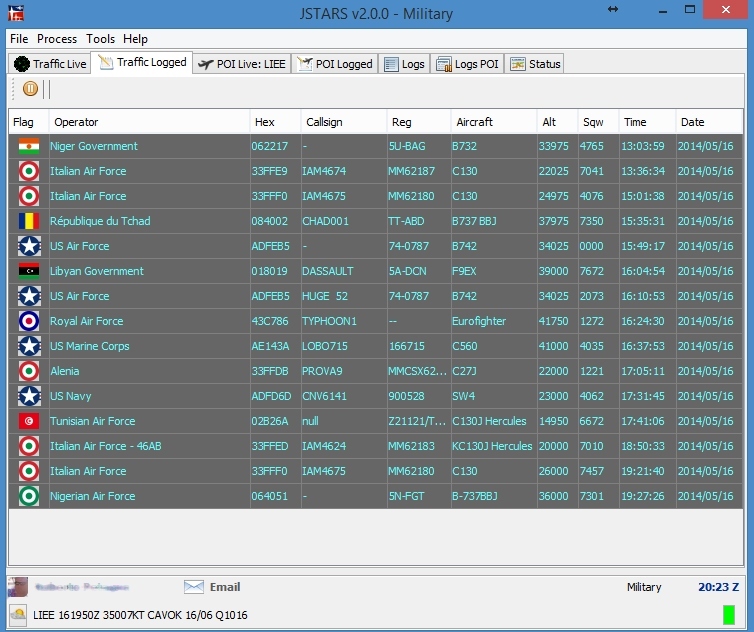 "JSTARS is a standalone desktop application for Windows systems and it works together virtual radar like Kinetic Aviation SBS-1 connected to the PC via USB port. It should have to work also with other virtual radars that use Kinetic protocol shared typically in the 30003 port for third part software (addon and plugins). JSTARS is able to detect airplanes in two main groups: Civilian and Military-Government. It means every time an airplane is detected by your virtual radar, your JSTARS could log it and could notify you about this detection. In the next version, it will be possible to detect and to notify also airplanes you want to monitor by a custom list. In this version, JSTARS wants to provide a wide help and support to all air traffic monitors, in particular all guys wanna log military and government air traffic. JSTARS offers also the new feature called “POI Point of Interest”, giving you the opportunity to monitor all air traffic around a fixed point or an airport. An advanced notification system allows you to receive information about what your radar has detected anytime and anywhere you are, thanks to email, Facebook, Twitter and web and coming soon also by your Windows Phone smartphone! JSTARS 2.0.0 has been totally rebuilt and new technologies and professional knowledge have been applied thanks to our cooperation with a famous airline with whom we worked for about one year for a customized version." I have downloaded it, but can't get it to run. It keeps prompting me to install Java which is already installed. rogerlong wrote: I have downloaded it, but can't get it to run. It keeps prompting me to install Java which is already installed. Didn't test it. Program has been developed to look for a valid IP address and port where raw data are available, so I think it should have to work also in a LAN. I have it connected to "base station" on separate PC but can't connect directly to SBS3, any ideas? Also, have you plans to do some more updates, such as make the column data in all tabs sortable ? Looking interesting, will carry on checking. DaveG wrote: I have it connected to "base station" on separate PC but can't connect directly to SBS3, any ideas? If I understood right: in a PC X there is SBS3 connected via USB and Basestation installed on it too; in a PC Y you run JSTARS but it's not able to receive datas from IP address/port of PC X.
I didn't test this configuration, so my knowledge about it is limited. Maybe you have to open firewall to make reachable IP address/ports ? DaveG wrote: Also, have you plans to do some more updates, such as make the column data in all tabs sortable ? as I did with previous JSTARS version, updates are welcome based on my users requests and needs or my personal purposes (JSTARS was born under my personal need to support my air traffic monitoring, specialized on mil/gov flights). Columns data are sortable in all tables, only in "Live traffic" is disabled because quick refresh to receive new incoming items.